Located about 60 miles south of Tuscany yet in the finest Tuscan tradition, Castiglion del Bosco offers travelers the option of staying in one of the 9 luxuriously appointed villas dotted around the estate or in one of the 23 suites in the Borgo, which sits atop a hill and is the center of activity with a spa, swimming pool, and dining options. The accommodations at Castiglion del Bosco are very possibly the finest, with a remarkable attention to the detail of construction and design that will not go unnoticed. The Tom Wieskopf designed golf course that opened in July 2011 limits access to members and guests of the estate. Staffed with pros from St Andrews, Scotland, the course is a beautiful layout and excellent design that you won’t want to pass up. I should also mention that in terms of food quality and wine, Castiglion del Bosco delivers a fabulous experience: it’s just consistently outstanding. Private cooking classes are offered in one of the most magnificent kitchens. A visit and tour of the onsite vineyard is a must for any visitor. The winery staff can set up blind and vertical tastings, and even take part in the fun with issued shears and boots and participate in the harvest. It shouldn’t come as a surprise that the service at Castiglion del Bosco is first class as well. Don’t worry about not speaking Italian as nearly the entire staff is fluent in English. 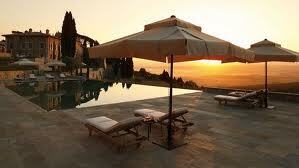 All in all, Italy can deliver a golf travel experience and much more, as it touches so many of the senses. It is a destination worthy of serious consideration for your next trip. This article grab your attention?